Scroll down to see upcoming shows and events. 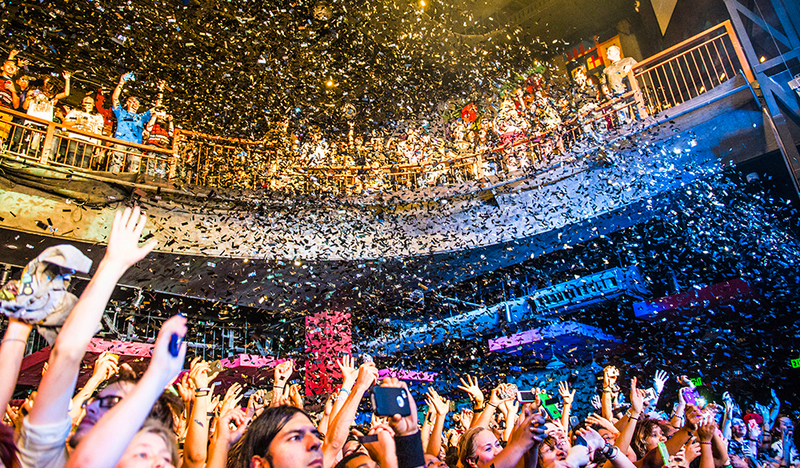 With a dozen locations in major cities around the country, House of Blues’ reputation means attracting major live shows that fill out their two Houston stages; the Music Hall that holds up to 1000 fans across two tiers, and the Bronze Peacock Room which hosts up to 200 people for intimate gatherings and live music events. You’ll also find special events in the upscale Foundation Room and live local shows in the House of Blues Restaurant and Bar on the ground floor. Located in the GreenStreet entertainment center near Discovery Green in central Downtown, House of Blues joins popular clothing retailers, delicious eateries, and even a bowling alley, making it worth arriving early to explore the surrounding businesses. On any given night, House of Blues may host the freshest hip hop artists, indie rock bands with huge followings, future Hall of Fame musicians, gut-busting comedians, and more. Inside the Bronze Peacock Room, fans can have the chance to take in acoustic performances by some of their favorite bands and enjoy up-and-coming artists. Opened in 2008, House of Blues is one of the most popular music venues in town and their adjoining restaurant makes for an easy call when deciding where to eat beforehand. The MetroRail Red Line stop just a block away also makes parking decisions less stressful, though there is a connected garage for those driving into Downtown. Jam out to a live show by British rockers The Cult when they take the stage for their “A Sonic Temple” tour at House of Blues. Admission Tickets start at $35, but you may find cheaper or better seats on TicketNetwork’s resale site.